The British media mogul Rupert Murdoch and his employee, Rebekah Brooks, chief executive of News International are held responsible for what appears to be the greatest press scandal in decades: tabloids paying up the police and hacking phones. The victims of the phone hackings done by journalists working at the British tabloid News of The World are many. They include ordinary people going through tragedies ( murder victims, murderers, terror victims – politicians, sports stars, movie stars and even the royal family. The scandal has touched the office of the Prime Minister David Cameron and it’s asking for urgent measures. Cameron has asked the tabloid to clarify its behavior and had called for inquiries regarding the police’s failure to identify the nature and the damage of the hacking. “It is absolutely disgusting, what has taken place, and I think everyone in this House and indeed this country will be revolted by what they have heard,” the Prime Minister said. There are several cases of phone hacking that are discussed at the moment. Among them there is the case of Graham Foulkes, the case of Milli Dowler and the case of Holly Wells and Jessica Chapman. Graham Foulkes is the father of a 22-year-old boy who died in the terrorist attack in 2005. When he was announced by the Metropolitan Police that he may be a phone hacking victim he said “I just felt stunned and horrified. I find it hard to believe someone could be so wicked and so evil, and that someone could work for an organization that even today is trying to defend what they see as normal practices” he told Associated Press. Milly Dowler was 13 years old when she died and her phone was also hacked after the murder. Holly Wells and Jessica Chapman were two schoolgirls who were murdered in 2002. Their parents are now informed by the police that their cell phones may have been hacked by the News Of The World employees, as well. Among the celebrities who fell victims of the phone hacking done by News Of The World, there are actors Sienna Miller and Hugh Grant, as well as people in the close entourage of the Royal family. 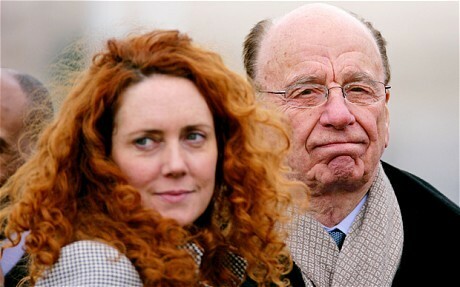 Despite the scandal, the media mogul, who owns several tabloids, said that he will not fire Rebekah Brooks, who is now running News International.